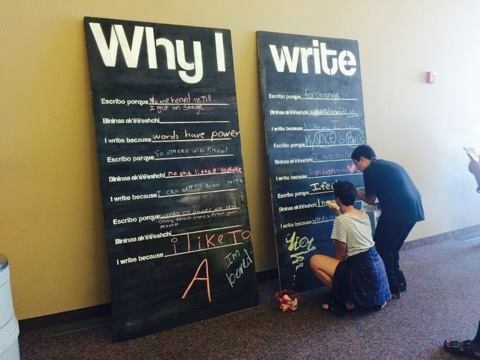 NACA Radical Poets write because…. 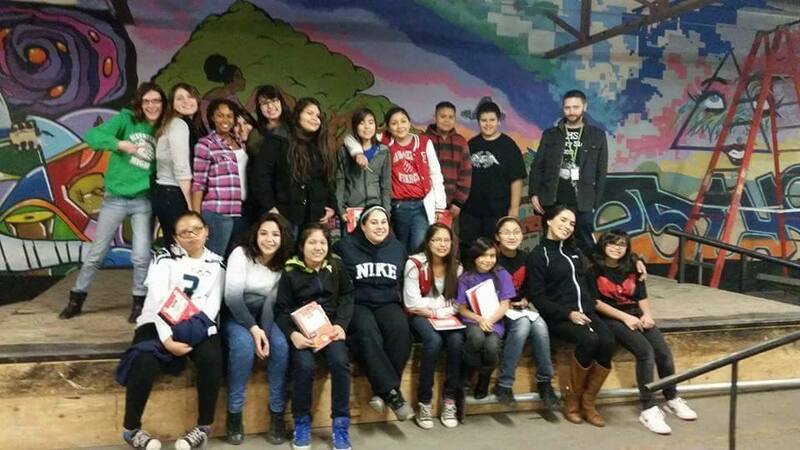 Native American Community Academy (NACA) Radical Poetry Club is comprised of young poets who strive to write their truths, celebrate their cultural identities and traditions, and poeticize the tough stuff like colonialism and debunking stereotypes of native people. They also write poetry that seeks to identify historical/current trauma that speaks out against violence against indigenous women and mother earth. They offer poems of resistance, resiliency and empowerment through the spoken and written word. The NACA Radical Poets are kids with causes. They rock the mic on a regular basis and have fun crafting their words into spoken word performances. They recently performed with other featured Indigenous and Mestiza poets as part of the Wordcraft Circle of Native American Writers and Storytellers’ Returning the Gift Literary Festival 2015 and received the WC Bright Star Youth Award from Wordcraft Circle of Native Writers and Storytellers. They also recently read for and with the United States Poet Laureate Juan Felipe Herrera at the National Hispanic Cultural Center. smoothly glides along my paper. BIO: Avrill Holmes is a member of the Native American Community Academy Radical Youth Poetry Team. NACA Radical Poets have recently won the WC Bright Star Youth Award. Holmes loves to eat Hot Cheetos and lay with her dog on Monday nights. BIO: Jordane Lewis is a member of the Native American Community Academy youth poetry team. Lewis has been published in, Kids with Causes: A poetry Anthology of Youth Voices and performed at the Women of the World Poetry Slam Nationals 2015. NACA Radical Poets have recently won the WC Bright Star Youth Award. Jordane likes to eat pizza and loves unicorns. She is a girl with a broken foot. I write because sometimes I can’t express myself with words straight from my mouth. I write because I know all of the beautiful thoughts. I write because on paper,in ink, everything seems to make sense. I write because I see beautiful things I have to write about. I write because even everything seems to go wrong, to fall apart, and break…this can NEVER go wrong, fall apart, or break. I write because I love, love, love, love to express myself with the many beautiful words of poetry. BIO: Janna Harker is a member of the Native American Community Academy Radical Youth Poetry Team. NACA Radical Poets have recently won the WC Bright Star Youth Award. Harker is crazy funny, has a weird crazy personality, and owns a crazy awesome heart. She is crazy. BIO: Tionna Tillotson is a member of the Native American Community AcademyRadical Youth Team. Tillotson has been published in in, Kids With Causes: A Poetry Anthology of Youth Voices and performed at the Women of the World Poetry Slam National 2015. NACA Radical Poets have recently WC the WC Bright Star Award. I write because words are like colors to me. I write because I keep my loved ones alive. I write because it inspires me to be creative and to be myself. I write because the beautiful words are like a waterfalls that move as fast as a heart beat. I write because my dad keeps me on my toes. I write because when my dad passed away it inspired me to be more outgoing. BIO: Esperanza Alirez is a member of the Native American c\Community Academy Radical Youth Poetry Team. Alirez has been published in kids with cause:A Poetry Anthology of Youth Voices and performed at the Women of the World Poetry Slam Nationals 2015.NACA Radical Poets have recently won the WC Bright Star Youth Award. Esperanza is fun and she likes to spend time with her family. It helps me escape from reality. I write because it helps me find who I really am. Because the pencil is unstoppable when it’s in my hand. I write because he always said to do what makes me happy. I write because he inspires me. I write to remember him and her and them. I write to express my feelings. I write to remember who I am. Because it calms me down. I write because the paper and pen call out my name. I write because my words speak loud as my voice someday will. Because my mind would explode if I didn’t write down what I thought. I write because my heart would stop if the pencil ever stopped too. I write because I CAN! BIO: Aliyah Saiz is a member of the Native American Community Youth Academy Radical Youth Poetry Team. Saiz has been published in, Kids With Causes: A Poetry Anthology of Youth Voices and performed at the Women of the World Poetry Slam Nationals 2015 NACA Radical Poets have recently won the WC Bright Star Youth Award. Saiz’s favorite basketball player is Jasmine Bradford #9! BIO: Kylie Gasper is a member of the Native American Community Academy Radical youth poets team. Gasper has been published in, kids with causes: A poetry Anthology of youth voices/ and performed at the women of the world poetry slam nationals 2015. NACA radical poets have recently won the WC bright star youth Award. Kylie Gasper is in gymnastics in level 3 and going to compete soon. I write because I am…A N.A.C.A RADICAL POET!!! I write because it helps my anxiety go away. I write because I believe poetry can save the world. I write because this is the only way I can be heard. I write because my poetry tells me I am not alone in this world. I write because my identity is the truth and will always be the truth. I write because I am a Native poem. BIO: Olivia Harrison is a member of the Native American Community Academy Radical Youth Poetry team. Harrison has been published in, Kids with causes: A poetry Anthology of youth Voices and performed at the Women of The World Poetry slam Nationals 2015. NACA radical Poets have recently won the WC Bright star Youth. Olivia’s favorite sport is Baseball not Softball. Previous Previous post: Mindy Mejia writes because….